Peter Pan Junior a Smash Hit!! You are here: Home » Blog » Peter Pan Junior a Smash Hit!! Students at Charter Day School performed a riveting theatrical adaptation of Peter Pan Junior in front of a sold-out crowd on Saturday May 5, 2018. 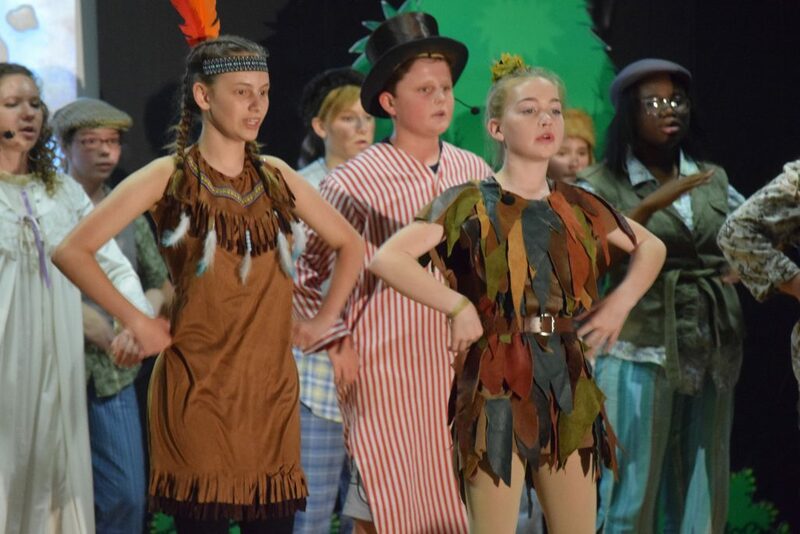 The play starred middle schoolers Alaina Natale as Peter Pan, Sophie Lundin at Wendy, Gavin Lindbert as Captain Hook, and Peyton Broyles as Tiger Lily. The performance included over 40 middle school students and took place at sister school Douglass Academy – located at 507 N. 6th St., Wilmington, NC 28401. The show was directed by Lauren Maasch, Music Teacher at Charter Day School. Mrs. Maasch directed a wildly successful adaptation of Cinderella last year. Mrs. Maasch stated next year the prestigious Charter Day School drama department will do a performance of the classic musical Annie.